Books on Tape, 2007. 10 CDs, 11 hours, 44 minutes. Throne of Jade is the second book about Temeraire, the dragon who fought with England against Napoleon’s forces in this delightful alternate history. In the earlier book, His Majesty’s Dragon, navy Captain Will Laurence captured a dragon’s egg from a French ship, and became that dragon’s companion in the Aerial Corps. After the events of the first book, the world learns that Temeraire’s egg was meant for Napoleon, for he is of a lineage that the Chinese only allow in the company of emperors or an emperor’s family. At the outset of Throne of Jade, a Chinese envoy has come, indignant that Temeraire is treated as the pet of a common sea captain, intending to persuade England to send Temeraire back to China. Negotiations are difficult, and England desperately wants trade to China kept free. Temeraire will not leave Laurence, and Laurence is willing to face hanging rather than trick him into leaving. So Temeraire and Laurence face a long sea voyage to China, encountering dangers and intrigue along the way. When they arrive in China, they see a country where dragons live almost as equals with humans, studying and learning as much as fighting. Will Temeraire be won over and decide to stay? These books are intriguing as they reveal “facts” about the lives of dragons, which seem so realistic, you quickly forget that they didn’t actually have dragons in those days. The characters are compelling, and you find yourself indignant with Laurence at the slight to his honour of even suggesting that he would lie to Temeraire. As before, the book reminded me of a Patrick O’Brien book, only with dragons — which I somehow find much more exciting. 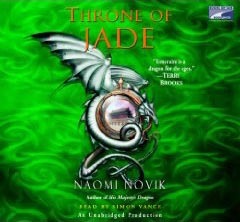 My plan was to listen to a different audiobook before I go on to the next book in Naomi Novik’s series. (There are five.) However, I find I can’t stand the wait! When I learned that our library had a copy of the next audiobook, Black Powder War on the shelves, I immediately checked it out and will start listening the next time I enter my car. I first chose to listen to this book because I couldn’t quite get around to reading it, but now I can’t bring myself to “read” it any other way. I have grown fond of the characters as portrayed by the voice of Simon Vance, and don’t want to miss out on that variety by reading it to myself and hearing only the voices my own mind can conjure up. This entry was posted on Thursday, August 27th, 2009 at 10:01 pm and is filed under Alternate History, Audiobooks, Fantasy, Fiction Review, Starred Review. You can follow any responses to this entry through the RSS 2.0 feed. You can leave a response, or trackback from your own site.